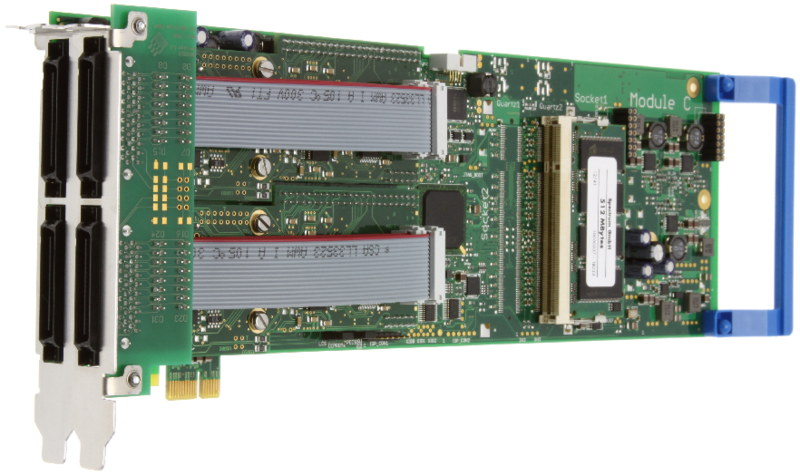 The M2i.70xx Express series of fast digital I/O boards offers a resolution between 1 bit and 64 bit with a maximum sampling rate of 125 MS/s (60 MS/s). All I/O lines of the card can be programmed for either input or output direction. The on-board memory of up to 2 GByte can be used completely for recording or replaying digital data. The internal standard synchronisation bus allows synchronisation of several cards of the M2i series. Therefore the M2i.70xx board can be used in combination with analog boards. 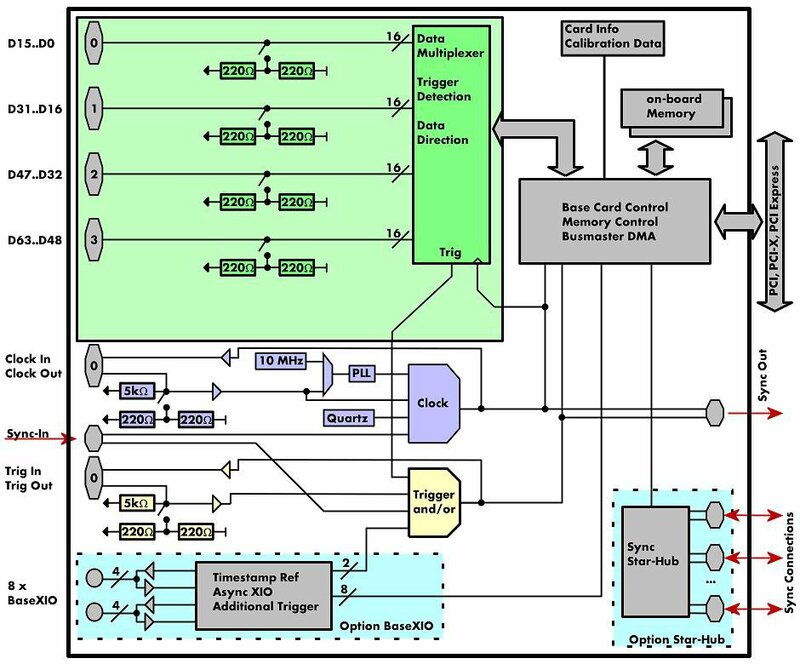 In contrast to the parallel PCI buses PCI Express slots contain serial point to point connections. Each connection pair (lane) is able to reach a burst connection speed of 250 MBytes/s. The Spectrum PCI Express cards base on the most commonly used x1 lane slot type. One advantage of the PCI Express technology is the direct connection of each slot allowing a full transfer bandwidth for each single card. On the software side there is no difference between PCI/PCI-X or PCI Express. PCI Express is the bus standard for PC based systems for the next couple of years. Today's State-of-the-art motherboards normally have a couple of PCI Express slots but only one or two PCI-X slots. Spectrum's PCI Express x1 cards can be used in any standard PCI Express slot be it x1, x4, x8 or x16. Only some dedicated PCI Express graphics slots may not work. The BaseXIO option offers 8 asynchronous digital I/O lines on the base card. The direction can be selected by software in groups of four. Two of these lines can also be used as additional external trigger sources. This allows the building of complex trigger conjunctions with external gated triggers as well as AND/OR conjunction of multiple external trigger sources like, for example, the picture and row synchronisation of video signals. In addition one of the I/O lines can be used as reference clock for the Timestamp counter. The FIFO mode is designed for continuous data transfer between measurement board and PC memory (up to 245 MB/s on a PCI-X slot, up to 125 MB/s on a PCI slot and up to 160 MB/s on a PCIe slot) or hard disk. The control of the data stream is done automatically by the driver on interrupt request. The complete installed on-board memory is used for buffer data, making the continuous streaming extremely reliable. Using the System Star-Hub for M2i series cards it is possible to synchronize several systems with each other having the same advantages that the standard Star-Hub gives. The system star-hub allows to extend the number of synchronous channels or set up multiple synchronous data streaming systems either for data storage or online calculations. When repeated output is used the data of the on-board memory is replayed continuously until a stop command is executed or N times. As trigger source one can use the external TTL trigger or the software trigger. The sequence mode allows to split the card memory into several data segments of different length. These data segments are chained up in a user chosen order using an additional sequence step memory with the ability to program loops and triggers and to reload data while output is running. When this mode is activated the data of the on-board memory will be replayed once after each trigger event. As Trigger source one can use the external TTL or software trigger. When singleshot output is activated the data of the on-board memory is replayed exactly one time. As trigger source one can use the external TTL trigger or the software trigger. The star-hub is an additional module allowing the phase stable synchronization of up to 16 boards in one system. Independent of the number of boards there is no phase delay between all channels. The star-hub distributes trigger and clock information between all boards. As a result all connected boards are running with the same clock and the same trigger. All trigger sources can be combined with OR/AND allowing all channels of all cards to be trigger source at the same time. The star-hub is available as 5 card and 16 card version. The 5 card version doesn't need an extra slot. All boards can be triggered using an external TTL signal. It's possible to use positive or negative edge also in combination with a programmable pulse width. An internally recognized trigger event can - when activated by software - be routed to the trigger connector to start external instruments. The Gated Sampling option allows data replay controlled by an external gate signal. Data is only replayed if the gate signal has a programmed level. The Multiple Replay option allows the fast repetition output on several trigger events without restarting the hardware. With this option very fast repetition rates can be achieved. The on-board memory is divided in several segments of same size. Each of them is generated if a trigger event occurs. For every bit of the digital input the pattern trigger defines individually the expected level or sets the bit to "don't care'. In combination with pulsewidth counter and edge detection the pattern trigger could be used to recognise a huge variety of trigger events. Defines the minimum or maximum width that a trigger pulse must have to generate a trigger event. Pulse width can be combined with channel trigger, pattern trigger and external trigger. This makes it possible to trigger on signal errors like too long or too short pulses. Using a dedicated connector a sampling clock can be fed in from an external system. It's also possible to output the internally used sampling clock to synchronize external equipment to this clock. All cards are delivered with full Linux support. Pre compiled kernel modules are included for the most common distributions like RedHat, Fedora, Suse, Ubuntu or Debian. The Linux support includes SMP systems, 32 bit and 64 bit systems, versatile programming examples for Gnu C++ as well as the possibility to get the driver sources for own compilation. Using the Spectrum Remote Server it is possible to access the M2p/M2i/M3i/M4i/M4x card(s) installed in one PC (server) from another PC (client) via local area network (LAN), similar to using a digitizerNETBOX. To operate it the remote server option has to be activated by a software license for any of the Spectrum cards in the remote system. This standard driver is included in the card delivery and it is possible to get the newest driver version free of charge from our homepage at any time. There are no additional SDK fees for the classical text-based programming. All boards are delivered with drivers for Windows 7, Windows 8 and Windows 10, all 32 bit and 64 bit. The product has two FX2 digital connectors with 40 poles. Two adapter cables from FX2 to IDC is included in the delivery. The option BaseXIO has an addtional eight SMB connections. All Spectrum products can be ordered as an option with a special docking station. Docking stations are external chassis and can be directly connected to a Laptop (ExpressCard interface) or a Standard PC (Plug-In card) and can house up to 13 cards. Combining a number of Spectrum M2p/M2i/M3i/M4i PCIe digitizers with a Tera-Store Data Streaming solution allows the capture and storage of long complex signals for extended periods of time. With systems available offering from 1 to 32 TB of storage and streaming rates up to 3 GB/s signals can be digitized and stored seamlessly for hours on end.